It’s finally over, the war has ended. PHP7 was released, and PHP6 will remain only a legend, a story of the version that never was. After a while I don’t think anybody expected it to be released anymore. Afterall, it’s been almost 10 years, out of the entire lifetime of 20 years for PHP. But how can such a highly anticipated version never show up? Let’s begin from the start, when, almost 10 years ago, PHP was becoming a “serious” language. After the PHP5 version, the object module was finally having specific visibility for methods and properties, objects were no longer copied, but sent by reference. These changes triggered a multitude of object oriented frameworks, which were now also targeting the enterprise environment, not only small websites. In all this context there was a problem, internationalisation. This is how PHP6 appeared, it should have used natively Unicode, more specifically UTF-16. This way everything would have been processed in a unique and international format. The project was started and maintained by Andrei Zmievski. Maybe today not many people know much about Andrei, but 10 years ago he was very popular for projects like Smarty and PHP-GTK. After a few years the project got stuck, and then PHP5.3 appeared. Even though it was bringing important changes, it wasn’t a major version because there was still hope that one day there will be a PHP6. There were however some people full of hope! And even more, they were ready to cash in on this bright hope! Either authors or editors, they knew one thing when it came to books (especially technical ones) that they have two properties: a target audience and a period of relevance. 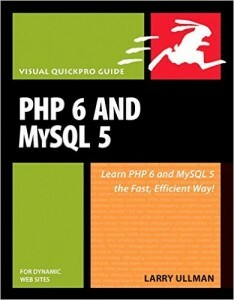 Larry wrote several books, including: “PHP and MySQL for Dynamic Web Sites: Visual QuickPro Guide (2nd Edition)” and of course “PHP and MySQL for Dynamic Web Sites: Visual QuickPro Guide”. Coincidentally, I had the opportunity to flick through all three books, but not in chronological order, I just randomly started with “PHP and MySQL for Dynamic Web Sites: Visual QuickPro Guide (2nd Edition)”. What is interesting is the striking resemblance, basically a 6 was added to the title and the rest is almost the same. In general, all books from Visual QuickPro Guide collection are targeting beginners, and from an edition to the next things don’t change too much, they are only adjusted. It’s interesting that in the cover image there are three authors, but on Amazon.com and on Wrox there are only two names, that’s why I wanted to single Thomas Myer out. This makes me wonder if Thomas Myer purposely asked to be removed or were there other factors at play? It’s strange to have your name on the book but not in the author listing of the publisher’s website. 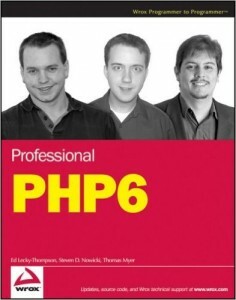 Not coincidentally there is also a “Professional PHP5” – Ed Lecky-Thompson, Heow Eide-Goodman, Steven D. Nowicki, Alec Cove. It’s truly a strange book, there isn’t a PHP5 equivalent, and even more, on the writter’s website there isn’t any other PHP book. Could there be a reason for that? In Larry Ullman’s case it’s just another covered subject, additional audiences targeted, but in this case it’s just strange, a single author, a single PHP book for a ghost version, published in 2008. It wasn’t very difficult to also find: “PHP Fast & Easy Web Development” – Julie C. Meloni. What is strange about this book is that Matt Telles doesn’t have any other PHP books, even though he wrote some for Python, C# and C++. Something tells me he was brought in just to adjust the original book for the new context. 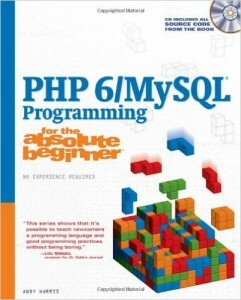 I thought it was just a personal supposition, but upon searching on Google I found he is also Technical Reviewer for “PHP 6/MySQL Programming for the Absolute Beginner (Cengage Learning PTR)”, book that I covered above. 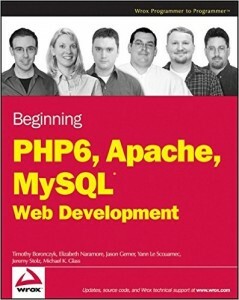 The original book was obviously: “Beginning PHP, Apache, MySQL Web Development” – Michael K. Glass, Yann Le Scouarnec, Elizabeth Naramore, Gary Mailer, Jeremy Stolz, Jason Gerner. Michael K. Glass and Gary Mailer got out and in their place Timothy Boronczyk went in. PHP was a very fashionable language in that period, and PHP6 was very awaited. But how can something like this be? How can there be some many books from important publishers for a programming language that never existed? The answer is simple: greed. There are two possible explanations: either the author tried to seize the market with a new version, or the publisher wanted to force it, in the hope of coining the market. 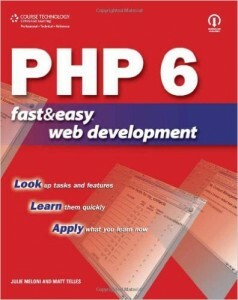 Probably the hope was that when PHP6 was coming out, they would have already have the books ready for shipping. This was another reason for not to rename PHP NG version into PHP6, it would have meant that a PHP version would have come out with a series of books already published, and what’s more, they were published for several years already. I bet that when the vote between PHP6 and PHP7 was happening there were some very hopeful editors. And now I wish you all, a pleasant reading!